Toyota Material Handing India Pvt. Ltd (TMHIN), a subsidiary of Toyota Industries Corporation (TICO), was incorporated on December 01, 2010 to serve the customers from the Indian sub-continent. With a deeper commitment for a sustainable business relationship with its customers, TMHIN is extending its technical excellence in the core sector of material handling equipment with a diverse spectrum of products marketed under the Toyota, BT and Raymond brands. Headquartered in Gurgaon in the National Capital Region of Delhi, TMHIN operates through its sales and service offices in Delhi, Bangalore, Chennai, Pune, Mumbai and Ahmedabad. 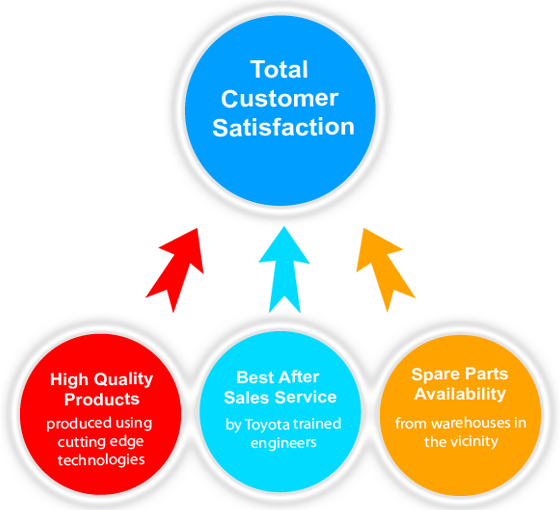 Besides supplying high quality products, Toyota realizes the importance of prompt after sales services and spare parts delivery expected by customers. This is reinforced with a strong team of Toyota trained service engineers and dedicated warehouses for spare parts at strategic locations spread across the country. We are committed to ensure maximum uptime of the equipment to aid our customer operate at high efficiency levels. Customers can enjoy the benefit of dealing directly with Toyota represented by its subsidiary, TMHIN, in India.